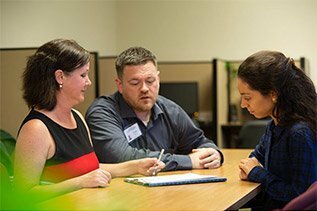 Our Intensive Outpatient Program (IOP) offers a unique experience of education, skill building, and processing personal issues in a confidential, small group setting. Our therapists have extensive expertise and training to support, guide, and motivate you. Our General Outpatient Program (GOP) allows patients to explore personal issues individually with a therapist and in a small group setting. This promotes trust and empowerment from the sharing experience. A specialized program designed by first responders in long-term recovery for first responders battling addiction. Our clinical team provides multifaceted treatment and guidance in a supportive and caring environment and are committed to helping police, firefighters, EMS and military achieve recovery. A discrete, specialized program designed specifically for healthcare workers battling addiction. Our clinical team provides treatment and guidance in a supportive and caring environment, and are committed to helping health professionals achieve recovery. PA DMV approved curriculum that provides assessment, counseling and risk reduction. Our goal is to prevent convicted drunk driving offenders from driving under the influence again. Family support sessions included with each program. For the most current information on what is happening at all of our locations select below.